Recruitment Marketing is a new discipline that brings modern marketing strategies to the recruiting process to help employers find and attract quality candidates. As a rapidly emerging practice, there are many new roles being created, and exciting career opportunities lie ahead. Whether you’re creating a new role for yourself, expanding your current responsibilities, hiring your first recruitment marketer or building out a team, these job descriptions can get you started. Available in Word and PDF. Today, the demand for experienced recruitment marketers exceeds the supply of people in the role. But it turns out, traditional “experience” isn’t everything. Recruitment Marketing is a new discipline that brings modern marketing strategies to the recruiting process to help employers find and attract quality candidates. As a rapidly emerging practice, there are many new roles being created, and exciting career opportunities lie ahead. One hitch: You won’t find many people with 5-10 years of experience. Today, the demand for experienced recruitment marketers exceeds the supply of people in the role. But traditional “experience” isn’t everything. Our conversations with the Rally Recruitment Marketing community show that most of today’s recruitment marketers are the first to hold their role and have learned their craft on the job. Successful candidates come from a variety of disciplines, not only Marketing and Recruiting. When hiring, our RallyRM Mentors tell us that passion, creativity and curiosity count a lot, and there are many transferable skills that can be developed working in other departments, such as writing and project management. When such a wide variety of career paths can prepare one for a career in Recruitment Marketing, the prospect of preparing a job description can seem daunting. We’ve got your back! Whether you’re hiring your first recruitment marketer, creating a new role for yourself or building out a team, these job descriptions can help you get started. 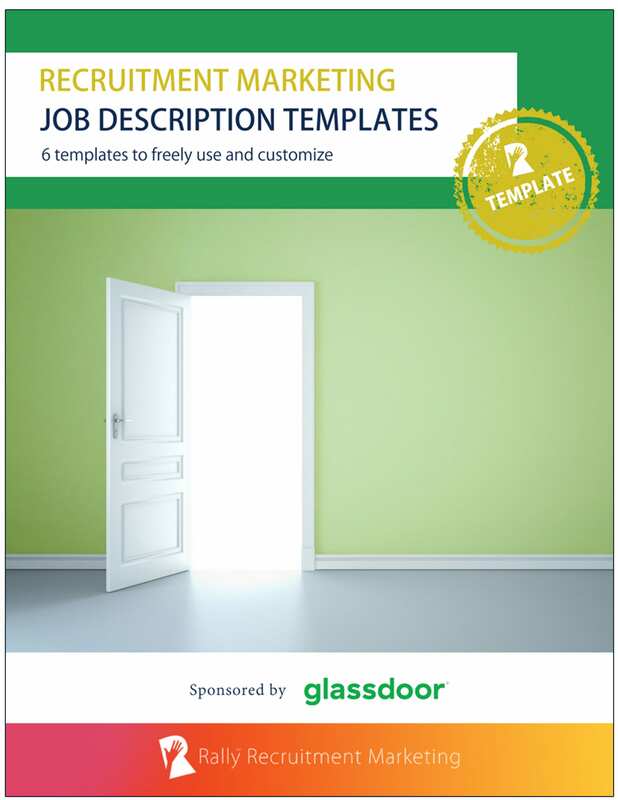 Download your copy of Rally’s Recruitment Marketing Job Description Templates, sponsored by Glassdoor, today. Glassdoor is a sponsor of Rally. Their sponsorship fee helps us to create educational content and events on Recruitment Marketing.